In a last-minute shuffle, UFC veteran Travis Wiuff has moved into the main event for this Saturday’s Mixed Fighting Championship: Russian Invasion event, to make its inaugural run at the Trump Taj Mahal’s 5,000-seat arena. Wiuff, who is on an eleven fight winning streak as of late, will take on Red Devil Sports Club member and M-1 heavyweight champion Roman Zentsov. According to matchmaker Miguel Iturate, American Top Team rep Jeff Monson had to bow out from the previously scheduled match-up due to an injury sustained yesterday in training. 27-4 Wiuff was given the green light early this afternoon, and reached for comment at the airport on route to the popular Jersey shore, the Minnesota native said he hasn’t had a second to spare to get excited about the opportunity. Pending Wiuff’s medical clearance by the New Jersey Athletic Control Board, the Euphoria Entertainment-promoted event will be ten fights strong going into Saturday night. For more information on the event, call (609) 449-1000 or (800) 825-8888. Tickets are available at www.ticketmaster.com. 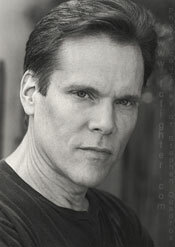 Thursday, March 11th at 10:00 PM Eastern, former Pride commentator Stephen Quadros will be on the popular new CBS TV show called Without A Trace, which stars Anthony LaPaglia. Check your local CBS TV listings for time and channel. Simply the best sweatshirt on the market today! 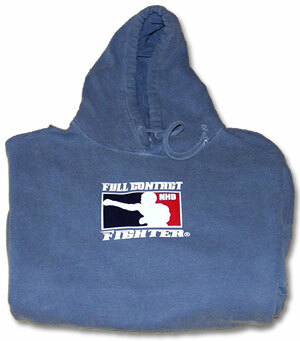 The most comfortable 100% cotton sweatshirt you ever put on! 11 oz of the finest relaxed sweatshirt "Guaranteed!" 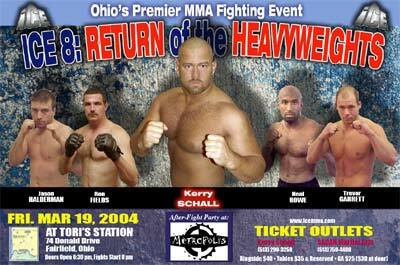 FAIRFIELD, Ohio — Kerry Schall has had more than his share of bad breaks in the sport of mixed martial arts. Fallen through ring ropes, suffering a broken vertebrae in his back. Had a year-long battle with a skin disease he got from an opponent. Fell down stairs and knocked himself out shortly before he was to fight. Add shoulder surgery, a torn ACL, a broken foot… and food poisoning. On Friday, March 19th, Schall will try to get things back on track when he fights Chris Herring in the main event of ICE 8: Return of the Heavyweights. The event is being held at Tori’s Station. Doors open at 6:30 p.m., first bout at 8 p.m.
"Kerry has had the kind of bad luck that makes you think twice… sometimes three times about getting on a plane with him," said manager Monte Cox. "Seriously, it has been just one thing after another… and nobody is more frustrated than he is about it." 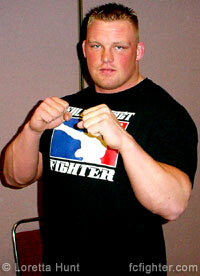 Schall, 6-foot-2 and 275 pounds, has a decent 17-6 record with two of his losses coming to notables Fedor Emelianenko and Bobby Hoffman (in overtime). He has won five of his last six bouts and hopes that 2004 will be his comeback year. In addition to the main event, the 19-bout card will include a couple of interesting matchups: Sluggers Ron Fields and Houston Alexander; jiu-jitsu standouts Michael Patt and Justin Ellison; and heavyweights John Murphy and Maurice Walker. "There are a lot of really good fights on this one," Cox said. "We knew after the last show (which featured Jeremy Horn), we had to follow up with something just as good or better. We’ve added like five or six more fights and have a lot of solid matchups." Metropolis, the site of the last event, will be the host of the after-fight party. The show can no longer be held there due to construction to the building. For tickets, contact Kerry Schall at 513 290-3259.